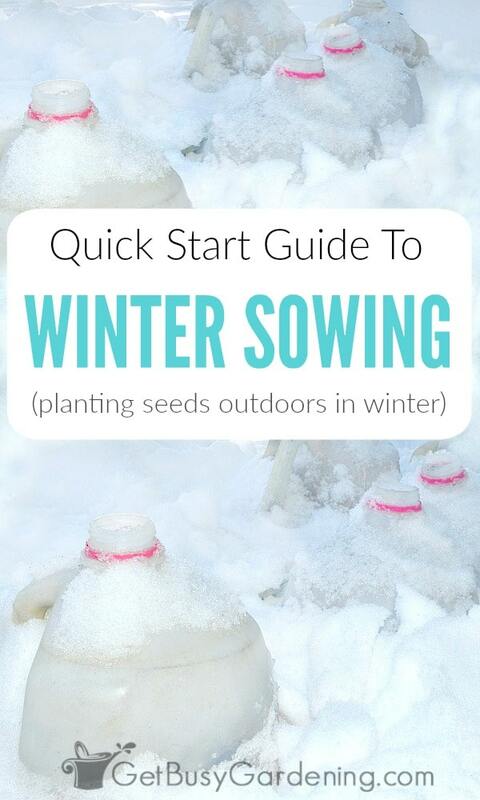 Winter sowing is a fun and easy way to start seeds outside during the winter. Seeds are sown in miniature greenhouses made from recycled plastic containers, and then put outside in the snow and freezing cold. The rest of the work is left to Mother Nature. For me, the biggest benefit of winter sowing my seeds is space. You see, since the winter sown containers go outside, they don’t take up space in the house. That is HUGE! Winter sown seedlings don’t need to be hardened off, they are already growing outside! Plus, winter sown seedlings are hardier and more robust than seeds sown indoors, which means they have a much higher survival rate. WOW! Are you ready to try winter seed sowing yet? Great, I will show you how. 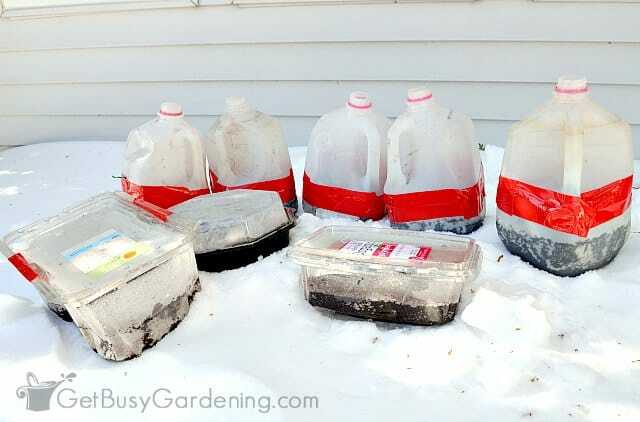 Step 1: Choose your winter sowing containers – The containers can be made out of items you throw out every day; things like milk jugs, 2 liter bottles, restaurant/deli/bakery food containers, ice cream buckets…etc. The shape and size of the container doesn’t matter, but it must be made of transparent plastic, be deep enough to allow for 2-3 inches of soil in the bottom, and tall enough to allow a few inches of headspace for the seedlings to grow. Step 2: Prepare the winter sowing containers – To prepare your containers, you will first want to clean the containers. If you’re using a tall narrow container like a 2 liter bottle or milk jug, you’ll need to cut the container in half using a pair of scissors. Next, poke holes in the top and bottom of the container. Heating a knife and melting the holes makes this task easier (use an old knife because it will turn black over time and have plastic residue on it), otherwise you can use a drill or something sharp to poke the holes. 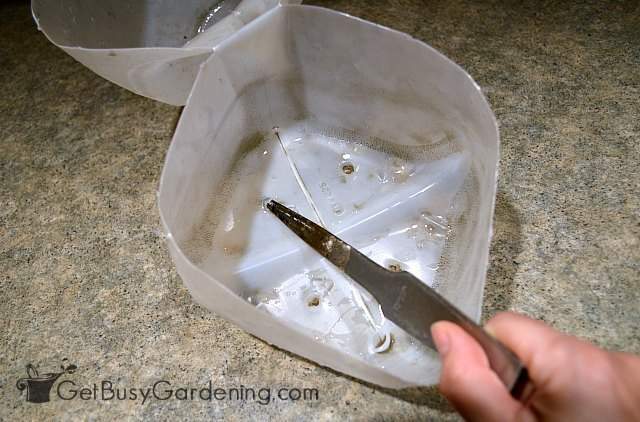 Poke enough drainage holes in the bottom of the container to allow the water to drain out so the seeds won’t drown. Add the same amount of holes in the top of the container (if you use milk jugs or 2 liter bottles, simply leave the caps off rather than poking holes). The holes in the top are there to vent the containers so they won’t overheat, and also to allow rain and moisture to enter the containers. Step 3: Add soil to the winter sowing container – The best potting soil to use in the containers is all purpose potting soil. I’ve also used the seed starting potting mixes that are specifically made for starting seeds, but those are a little more expensive. Just make sure you buy a good potting mix to use in your containers – don’t go super cheap on the potting soil. Cheap dirt is too heavy and the seeds will have a hard time germinating, or may end up rotting. Plus cheap potting soil could be full of weed seeds. Always use fresh, sterile potting soil when starting seeds; and never, never use soil from your garden in any of your containers. Step 4: Plant the seeds – The best types of seeds to use for winter sowing are the seeds of cold hardy annuals, herbs and cold crop vegetables, or plants that are perennial in your zone. If you’re unsure, check the seed packets. Look for terms like “self sowing”, “direct sow outside in the fall”, “direct sow outside in early spring” or “cold stratification”. Keywords like these are good indicators of seeds that will work well for winter sowing. The number of seeds you add to each container is up to you, but I prefer to space them out a bit to make it easier to separate the seedlings for planting. If the seeds are sown too thick, they will be difficult to separate once they have grown into seedlings. Read my post about how to choose the best seeds for winter sowing, a get list of seeds I’ve had success winter sowing. Step 5: Label your winter sowing containers – When you plant seeds in the dead of winter, you will forget what’s in the containers by spring (trust me on this one! ), so you’ll definitely want to label them. There are a few ways you could label your containers. Some people write on masking or duct tape, and others write directly on the top of the container. However, if you use pencil or a permanent marker on top of the containers, the writing will eventually fade in the sun, and could be unreadable by spring. I recommend using a paint pen for writing on the tops of your containers.If you choose to use tape, put it on the bottom of the container so the writing won’t fade in the sun. My preferred method for labeling my containers is to use plastic plant markers (or make my own using cut up old vinyl mini blinds) and writing on them with pencil. Then I push the marker into the soil, and have never had one of them fade. 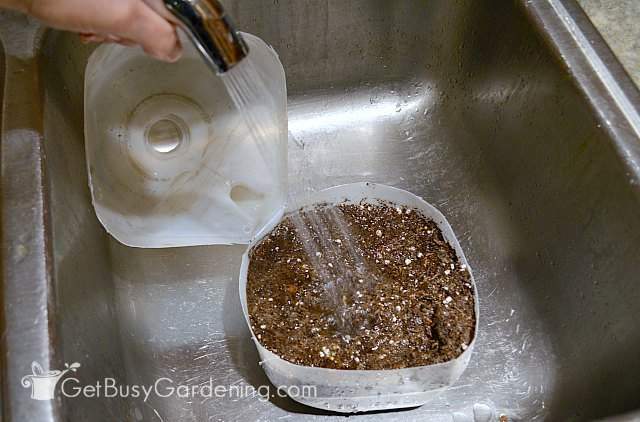 Step 6: Water the seeds – After you’re done planting seeds in your containers, water the potting soil thoroughly, and allow the containers to drain before moving them outside. I give mine a light shower with the sprayer in my kitchen sink because it won’t disrupt the soil. If the soil is really dry, water the container a few times to make sure the soil is evenly moist. 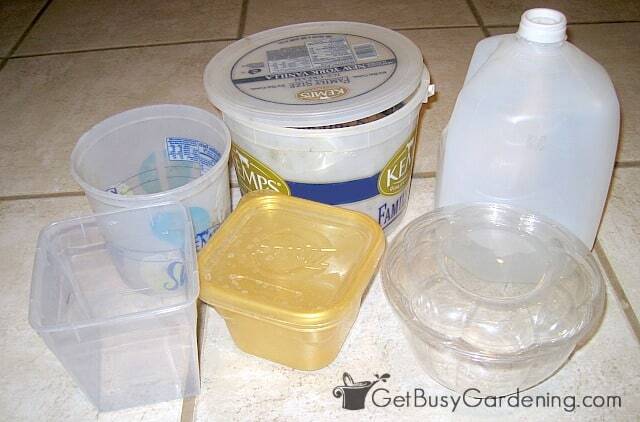 Step 7: Put the lids on the containers – Putting the lids on your containers depends on what type of container you use. If the lid snaps on and fits tight, then you’re done. If you used a tall container that you cut in half (i.e. : milk jug, 2 liter bottle), then you can use duct tape (or other heavy duty tape) to attach the lid back onto the container (but leave the caps off). 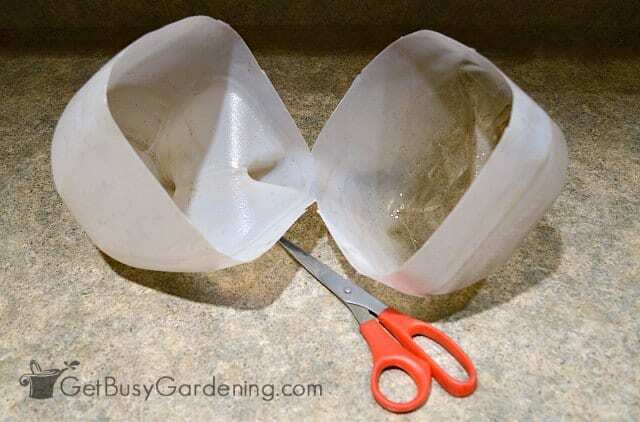 You can tape the lids on any container if the lid doesn’t fit tightly, just make sure you don’t completely cover the transparent parts of the container, or the holes you made way back in step 2. Step 8: Put the winter sown containers outside – Move your containers outside to a spot where they are protected from heavy wind, but will get moisture and full sun. If you have pets or children, put the containers on a table or other spot where they will be out of reach. Step 9: Forget about them until spring – Once your winter sown seed containers are moved outside, you can pretty much forget about them until early spring. Don’t worry, it’s OK if they’re completely covered by snow for a few months. Leave them be. Once the weather starts to warm up in the spring, check your winter sown containers regularly for any signs of seedlings. Hardy plants will start to germinate first, cold crop vegetables like broccoli, lettuce, spinach and spring blooming perennials. The only maintenance you have to do in the spring is to make sure the winter sown containers don’t overheat, and that the soil doesn’t dry out. Those mini greenhouses can get pretty hot inside in the sun, so you may need to vent them more. 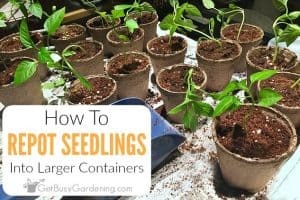 Once the seedlings get tall enough where they are touching the top of the inside of the container, it’s time to remove the lids. Winter sown seedlings can dry out pretty quickly once you take the lids off, so check them at least once a day and water if necessary. Once the lids are off, keep an eye on the weather report. If there is a chance for freezing temperatures, cover the containers with a sheet or blanket overnight. Next Steps: If you want more help learning how to winter sow, pick up a copy of my Winter Sowing eBook. It’ll be your essential winter sowing guide that will walk you through every step of the process in detail. 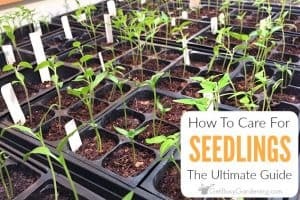 If you want learn how to easily grow all of your plants from seeds, then the Online Seed Starting Course would be perfect for you! It is an in-depth online training that will walk you through everything you need to know about growing all types of seeds, step-by-step. 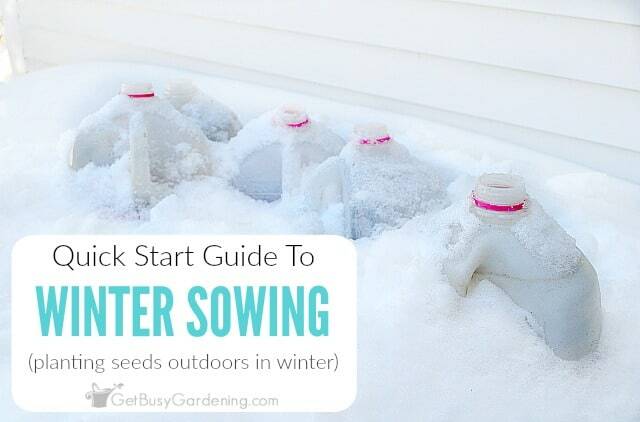 Have you ever tried winter sowing yet? Share your tips in the comments section below. Thanks, I'm glad you like my post! Yes, it's fine if the containers get covered by snow. That's a great post Amy; it was very informative and well-composed. Now I understand why we've saved a pile of stuff that normally would go in the recycling or garbage! I thought of a couple questions. I have a question about Coleus seeds. I'm pretty sure they are too sensitive for winter sowing so how do you recommend I start them? Indoors in a sunny window? Outdoors after last frost? My plan is to have them in pots for the summer and them I'll take cuttings for next year. Thanks again for your excellent guidance! Coleus are very easy to start in a sunny window in your house. They don't require any special seedling care and won't become leggy inside. You can also use the winter sowing method in early spring (April/May) or sow them directly into your pot outside in May. They are very easy to grow from seed. Hi Theresa! Glad to hear you're going to try winter sowing, how exciting! I usually try to space my seeds about an inch apart in the containers. Sometimes I squeeze them in closer if I have a few seeds left over. You have no idea how excited I am that I found your blog posts on winter sowing. I bought seeds today and will start my "sowing" project this week. Yeah!! Good luck and feel free to ask my any questions. So, I have a couple of silly questions! I apologize for their ridiculousness–I'm originally a city girl, and my gardening attempts have not gone well, but I really would like to get growing! Hi, great question (and totally not ridiculous)! 1) Yes, as long as you keep them out of the intense afternoon sun. You won't have to worry about this too much until it starts to get warmer. This will be my first time winter sowing as I had never heard of it before. My tomatoes actually do it on their own in my garden, as I've had quite a few volunteers the last couple years, so I guess I have been doing it without knowing it. I am looking forward to trying it here in southwest Ohio. Great, glad to hear you're going to give it a try. Good luck! Great, hope it works well for you! Good luck with your new garden. Why not just directly sow them in late fall where you want them to grow? Hey! Great post by the way loved it 🙂 My only question is when would be a good general start date for putting the containers outside? Thanks, glad you like the post. Some people make a ritual of it and start winter sowing on the winter solstice. But I usually start sometime in January or February, whenever I have time to get started. I'm in Minnesota (zone 4), so if you live in a warmer climate, you can start earlier. But don't start until the evening temperatures are consistently below freezing. Hi Alice! Thanks for the nice comment about my post. 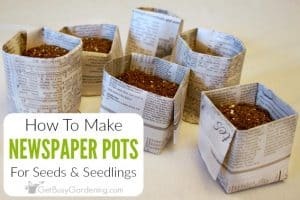 Great post 🙂 My question is how many seeds to put in each container? Also how do you separate them when you are ready to plant without doing to much damage to the roots? The number of seeds you winter sow in each container depends on the type or seed and your preference. Some people like to sow seeds really thick, others like to sow only a few seeds per container. The thicker you sow the seeds, the harder they can be to separate for planting. I personally prefer to sow the seeds farther apart so they are easier to separate. First of all, thank you so much for this new technique. the only question I have is : when you moisten the soil and then put it outside in winter condition, it turns into icy clump with the seeds in it. Won't it hurt them? Larisa, this method works just like in nature. The seeds in the ground in our gardens are frozen and buried under all that snow during the winter, and then they germinate in the spring when they're ready. Winter sowing seeds works the same way. The benefits of winter sowing rather than directly sowing the seeds into the garden is that the containers will protect the seeds from being washed away when it rains or bothered by pests. Great post! Very thorough. I love growing all kinds of things in the cooler temperatures. Isn’t it amazing that something as simple as a plastic milk jug can serve as a mini greenhouse? Love it! I hope everyone who reads this will give it a try. Great tips. Yes, it is amazing and lots of fun! I hope everyone will give it a try too. Thanks again; I’m going to start it this week! Yes, it can get down to about -20F or -30F during harsh winters. It’s all about the seeds you use. Perennials or anything that seeds itself in your climate will work great. I usually wait until late January or Feb to start winter sowing my cold weather vegetables, that way they won’t be in the deep freeze for quite as long. We live in PA. Can we start winter sewing now or is it too late? You can start now, it should still work. Awesome, hope it works great for you!! Would an adoption of this method work for early spring sowing? I’m in Wisconsin, and would like to get a jump-start on my seedlings. What do you think the outcome would be if I planted seeds now (mid-March) in my raised garden, then put the salad container over the seeds to act like a greenhouse? I think that would work great. 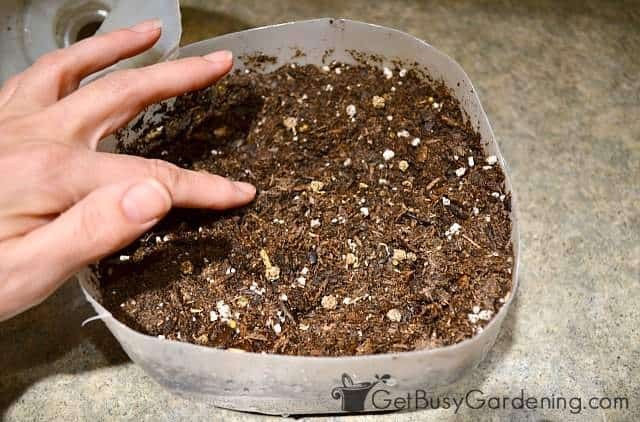 If it gets really cold again after the seeds start sprouting, you could always toss a blanket over the top of the containers to keep them warm overnight. Good luck! Great ideas and I’m desperate to begin as its Dec tomorrow and I’m already getting withdrawal symptoms from gardening. Here in North Uk, we have a lot of rain, strong winds throughout from now until April and sometimes frost on and off for between now and May. I’m going to be using gallon water bottles, square ones and they have a cap. Do I leave the cap off all the time? Or would I put it back on when it’s heavy rain for several days forecast just to protect them? I know what you mean, I’m already going through withdrawals too! 🙂 Haha! It’s best to leave the caps off of the water jugs for ventilation. As long as the opening is small, they won’t get washed away from the rain. These are great tips! I need to share this with my friends up north stuck in all this snow! Thanks for sharing! Can I also sow echeveria and sepervivum seeds in the same way? If they are cold hardy plants, then the winter sowing method could work for them. I’ve never tried it using those seeds before. I would definitely test it out with a few seeds to see if it works, rather than using all of your seeds for this method. I just started winter sowing. Yesterday, I planted cherry tomatoes, beef tomatoes, basil, beetroot and daisies. I’m not quite sure if this is going to work. My husband laughs at me and says I can not plant anything when there is snow. Finding your website gives me hope. Do I have to take them in when snow comes or leave them out? Haha, don’t listen to him! People laugh at me when I tell them about winter sowing too. 😀 But it works! No, you don’t need to bring your containers inside at all. Just leave them out, and they will be fine even if they’re completely covered by snow! However, the winter sowing method doesn’t work for all types of seeds… so, a few of the ones you planted may not grow (but please don’t feel bad!!). Here’s a list of great seeds to use for winter sowing to help you out. 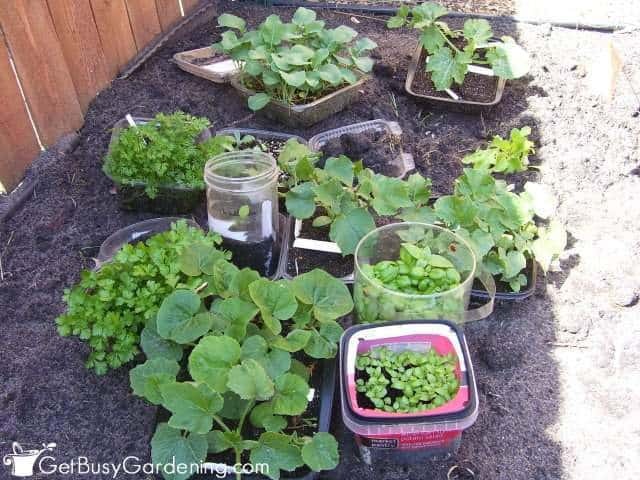 I may have missed something in your post – I was thinking of starting seedlings indoors in small pots and transplant outside after the threat of frost/snow is over. Is there a reason you would not start indoors? Winter sowing is just an alternative method of starting seeds, and works great for certain types of seeds. I still start many other seeds indoors under lights, it depends on the type of seed. Here’s a list of seeds that work great with the winter sowing method… How To Choose The Best Seeds For Winter Sowing. 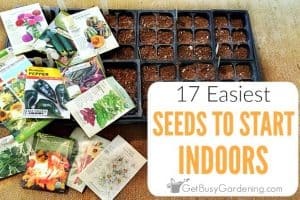 And here’s some info to get you started with growing seeds indoors… Tips For Growing Seeds Indoors For Beginners.